Columbia University (Columbia; officially Columbia University in the City of New York) is a private Ivy League research university in Upper Manhattan, New York City. Established in 1754, Columbia is the oldest institution of higher education in New York and the fifth-oldest institution of higher learning in the United States. It is one of nine colonial colleges founded prior to the Declaration of Independence, seven of which belong to the Ivy League. It has been ranked by numerous major education publications as among the top ten universities in the world. Columbia was established as King's College by royal charter of George II of Great Britain in reaction to the founding of Princeton University in New Jersey. It was renamed Columbia College in 1784 following the Revolutionary War and in 1787 was placed under a private board of trustees headed by former students Alexander Hamilton and John Jay. 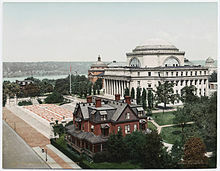 In 1896, the campus was moved from Madison Avenue to its current location in Morningside Heights and renamed Columbia University. Columbia scientists and scholars have played an important role in the development of notable scientific fields and breakthroughs including: brain-computer interface; the laser and maser; nuclear magnetic resonance; the first nuclear pile; the first nuclear fission reaction in the Americas; Thomas Hunt Morgan's drosophila experiment – considered the origin of modern genetics; the first evidence for plate tectonics and continental drift; and much of the initial research and planning of the Manhattan Project during World War II. The Columbia University Physics Department has been affiliated with 33 Nobel Prize winners as alumni, faculty or research staff, the third most of any American institution behind MIT and Harvard. In addition, 22 Nobel Prize winners in Physiology and Medicine have been affiliated with Columbia, the third most of any American institution. The university's research efforts include the Lamont-Doherty Earth Observatory, Goddard Institute for Space Studies and accelerator laboratories with major technology firms such as IBM. Columbia is one of the fourteen founding members of the Association of American Universities and was the first school in the United States to grant the M.D. degree. The university administers the Pulitzer Prize annually. Columbia is organized into twenty schools, including three undergraduate schools and numerous graduate schools. It maintains research centers outside of the United States known as Columbia Global Centers. In 2018, Columbia's undergraduate acceptance rate was 5.1%, making it one of the most selective colleges in the United States, and the second most selective in the Ivy League after Harvard. Columbia is ranked as the 3rd best university in the United States by U.S. News & World Report behind Princeton and Harvard. In athletics, the Lions field varsity teams in 29 sports as a member of the NCAA Division I Ivy League conference. The university's endowment stood at $10.9 billion in 2018, among the largest of any academic institution. As of 2018[update], Columbia's alumni and affiliates include: five Founding Fathers of the United States — among them an author of the United States Constitution and co-author of the Declaration of Independence; three U.S. presidents; 29 foreign heads of state; 10 Justices of the United States Supreme Court, two of whom currently serve; 96 Nobel laureates; 101 National Academy members; 38 living billionaires; 11 Olympic medalists, 39 Academy Awards winners; and 125 Pulitzer Prizes recipients. Discussions regarding the founding of a college in the Province of New York began as early as 1704, at which time Colonel Lewis Morris wrote to the Society for the Propagation of the Gospel in Foreign Parts, the missionary arm of the Church of England, persuading the society that New York City was an ideal community in which to establish a college. However, it was not until the founding of the College of New Jersey (the present Princeton University) across the Hudson River in New Jersey that the City of New York seriously considered founding a college. In 1746, an act was passed by the general assembly of New York to raise funds for the foundation of a new college. In 1751, the assembly appointed a commission of ten New York residents, seven of whom were members of the Church of England, to direct the funds accrued by the state lottery towards the foundation of a college. In November 1813, the College agreed to incorporate its medical school with The College of Physicians and Surgeons, a new school created by the Regents of New York, forming Columbia University College of Physicians and Surgeons. The college's enrollment, structure, and academics stagnated for the majority of the 19th century, with many of the college presidents doing little to change the way that the college functioned. In 1857, the college moved from the King's College campus at Park Place to a primarily Gothic Revival campus on 49th Street and Madison Avenue, where it remained for the next forty years. During the last half of the 19th century, under the leadership of President F.A.P. Barnard, the president that Barnard College is named after, the institution rapidly assumed the shape of a modern university. Barnard College was created in 1889 as a response to the university's refusal to accept women. By this time, the college's investments in New York real estate became a primary source of steady income for the school, mainly owing to the city's expanding population. University president Seth Low moved the campus from 49th Street to its present location, a more spacious campus in the developing neighborhood of Morningside Heights. Under the leadership of Low's successor, Nicholas Murray Butler, who served for over four decades, Columbia rapidly became the nation's major institution for research, setting the "multiversity" model that later universities would adopt. Prior to becoming the president of Columbia University, Butler founded Teachers College, as a school to prepare home economists and manual art teachers for the children of the poor, with philanthropist Grace Hoadley Dodge. Teachers College came under the aegis of Columbia University in 1893 and is currently affiliated as the university's Graduate School of Education. Research into the atom by faculty members John R. Dunning, I. I. Rabi, Enrico Fermi and Polykarp Kusch placed Columbia's Physics Department in the international spotlight in the 1940s after the first nuclear pile was built to start what became the Manhattan Project. 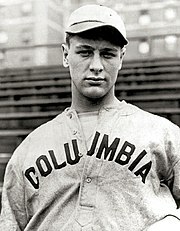 In 1928, Seth Low Junior College was established by Columbia University in order to mitigate the number of Jewish applicants to Columbia College. The college was closed in 1938 due to the adverse effects of the Great Depression and its students were subsequently taught at Morningside Heights, although they did not belong to any college but to the university at large. There was an evening school called University Extension, which taught night classes, for a fee, to anyone willing to attend. In 1947, the program was reorganized as an undergraduate college and designated the School of General Studies in response to the return of GIs after World War II. In 1995, the School of General Studies was again reorganized as a full-fledged liberal arts college for non-traditional students (those who have had an academic break of one year or more, or are pursuing dual-degrees) and was fully integrated into Columbia's traditional undergraduate curriculum. Within the same year, the Division of Special Programs—later the School of Continuing Education, and now the School of Professional Studies—was established to reprise the former role of University Extension. While the School of Professional Studies only offered non-degree programs for lifelong learners and high school students in its earliest stages, it now offers degree programs in a diverse range of professional and inter-disciplinary fields. The Nicholas Murray Butler Library, known simply as Butler Library, is the largest single library in the Columbia University Library System, and is one of the largest buildings on the campus. Proposed as "South Hall" by the university's former President Nicholas Murray Butler as expansion plans for Low Memorial Library stalled, the new library was funded by Edward Harkness, benefactor of Yale's residential college system, and designed by his favorite architect, James Gamble Rogers. It was completed in 1934 and renamed for Butler in 1946. The library design is neo-classical in style. Its facade features a row of columns in the Ionic order above which are inscribed the names of great writers, philosophers, and thinkers, most of whom are read by students engaged in the Core Curriculum of Columbia College. As of 2012[update], Columbia's library system includes over 11.9 million volumes, making it the eighth largest library system and fifth largest collegiate library system in the United States. In April 2007, the university purchased more than two-thirds of a 17 acres (6.9 ha) site for a new campus in Manhattanville, an industrial neighborhood to the north of the Morningside Heights campus. Stretching from 125th Street to 133rd Street, the new campus will house buildings for Columbia's Business School, School of International and Public Affairs, and the Jerome L. Greene Center for Mind, Brain, and Behavior, where research will occur on neurodegenerative diseases such as Parkinson's and Alzheimer's. The $7 billion expansion plan includes demolishing all buildings, except three that are historically significant, eliminating the existing light industry and storage warehouses, and relocating tenants in 132 apartments. Replacing these buildings will be 6,800,000 square feet (630,000 m2) of space for the university. Community activist groups in West Harlem fought the expansion for reasons ranging from property protection and fair exchange for land, to residents' rights. Subsequent public hearings drew neighborhood opposition. As of December 2008[update], the State of New York's Empire State Development Corporation approved use of eminent domain, which, through declaration of Manhattanville's "blighted" status, gives governmental bodies the right to appropriate private property for public use. On May 20, 2009, the New York State Public Authorities Control Board approved the Manhanttanville expansion plan and the first buildings are under construction. NewYork-Presbyterian Hospital is affiliated with the medical schools of both Columbia University and Cornell University. According to U.S. News & World Report's "2018-19 Best Hospitals Honor Roll and Medical Specialties Rankings", it is ranked tenth overall and third among university hospitals. Columbia's medical school has a strategic partnership with New York State Psychiatric Institute, and is affiliated with 19 other hospitals in the U.S. and four hospitals overseas. Health-related schools are located at the Columbia University Medical Center, a 20 acres (8.1 ha) campus located in the neighborhood of Washington Heights, fifty blocks uptown. Other teaching hospitals affiliated with Columbia through the NewYork-Presbyterian network include the Payne Whitney Clinic in Manhattan, and the Payne Whitney Westchester, a psychiatric institute located in White Plains, New York. On the northern tip of Manhattan island (in the neighborhood of Inwood), Columbia owns 26-acre (11 ha) Baker Field, which includes the Lawrence A. Wien Stadium as well as facilities for field sports, outdoor track, and tennis. 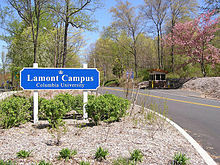 There is a third campus on the west bank of the Hudson River, the 157-acre (64 ha) Lamont-Doherty Earth Observatory and Earth Institute in Palisades, New York. A fourth is the 60-acre (24 ha) Nevis Laboratories in Irvington, New York for the study of particle and motion physics. A satellite site in Paris, France holds classes at Reid Hall. 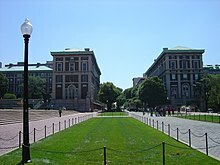 Columbia University received 40,203 applications for the class of 2022 (entering 2018) and a total of 2,214 were admitted to the two schools for an overall acceptance rate of 5.5%, making Columbia the third most selective college in the United States behind Stanford and Harvard as well as the second most selective college in the Ivy League. According to the 2012 college selectivity ranking by U.S. News & World Report, which factors admission and yield rates among other criteria, Columbia was tied with Yale, Caltech and MIT as the most selective colleges in the country. Columbia is a racially diverse school, with approximately 52% of all students identifying themselves as persons of color. Additionally, 50% of all undergraduates received grants from Columbia. The average grant size awarded to these students is $46,516. In 2015–2016, annual undergraduate tuition at Columbia was $50,526 with a total cost of attendance of $65,860 (including room and board). On April 11, 2007, Columbia University announced a $400m to $600m donation from media billionaire alumnus John Kluge to be used exclusively for undergraduate financial aid. The donation is among the largest single gifts to higher education. Its exact value will depend on the eventual value of Kluge's estate at the time of his death; however, the generous donation has helped change financial aid policy at Columbia. Annual gifts, fund-raising, and an increase in spending from the university's endowment have allowed Columbia to extend generous financial aid packages to qualifying students. As of 2008[update], undergraduates from families with incomes as high as $60,000 a year will have the projected cost of attending the university, including room, board, and academic fees, fully paid for by the university. That same year, the university ended loans for incoming and then-current students who were on financial aid, replacing loans that were traditionally part of aid packages with grants from the university. However, this does not apply to international students, transfer students, visiting students, or students in the School of General Studies. In the fall of 2010, admission to Columbia's undergraduate colleges Columbia College and the Fu Foundation School of Engineering and Applied Science (also known as SEAS or Columbia Engineering) began accepting the Common Application. The policy change made Columbia one of the last major academic institutions and the last Ivy League university to switch to the Common Application. In 1919, Columbia established a student application process characterized by The New York Times as "the first modern college application." The application required a photograph of the applicant, the maiden name of the applicant's mother, and the applicant's religious background. The President of Columbia University, who is selected by the Trustees in consultation with the Executive Committee of the University Senate and who serves at the Trustees' pleasure, is the chief executive officer of the university. Assisting the President in administering the University are the Provost, the Senior Executive Vice President, the Executive Vice President for Health and Biomedical Sciences, several other vice presidents, the General Counsel, the Secretary of the University, and the deans of the Faculties, all of whom are appointed by the Trustees on the nomination of the President and serve at their pleasure. Lee C. Bollinger became the 19th President of Columbia University on June 1, 2002. A prominent advocate of affirmative action, he played a leading role in the twin Supreme Court cases—Grutter v Bollinger and Gratz v Bollinger—that upheld and clarified the importance of diversity as a compelling justification for affirmative action in higher education. A leading First Amendment scholar, he is widely published on freedom of speech and press, and[when?] serves on the faculty of Columbia Law School. 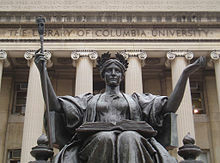 Columbia has three official undergraduate colleges: Columbia College (CC), the liberal arts college offering the Bachelor of Arts degree; the Fu Foundation School of Engineering and Applied Science (also known as SEAS or Columbia Engineering), the engineering and applied science school offering the Bachelor of Science degree; and The School of General Studies (GS), the liberal arts college offering the Bachelor of Arts degree to non-traditional students undertaking full- or part-time study. Barnard College, an undergraduate college of the greater Columbia Community, is an all-women's institution and an academic affiliate in which students receive a Bachelor of Arts degree that is conferred by the Columbia University Board of Trustees and is signed by the President of Columbia University. Barnard students are also eligible to cross-register classes that are available through the Barnard Catalogue and alumnae can join the Columbia Alumni Association. Joint degree programs are available through Union Theological Seminary, the Jewish Theological Seminary of America, as well as through the Juilliard School. 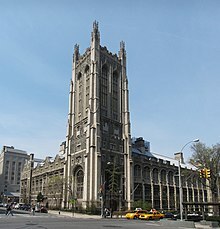 Teachers College and Barnard College are faculties of the university; both colleges' presidents are deans under the University governance structure. The Columbia University Senate includes faculty and student representatives from Teachers College and Barnard College who serve two-year terms; all senators are accorded full voting privileges regarding matters impacting the entire University. 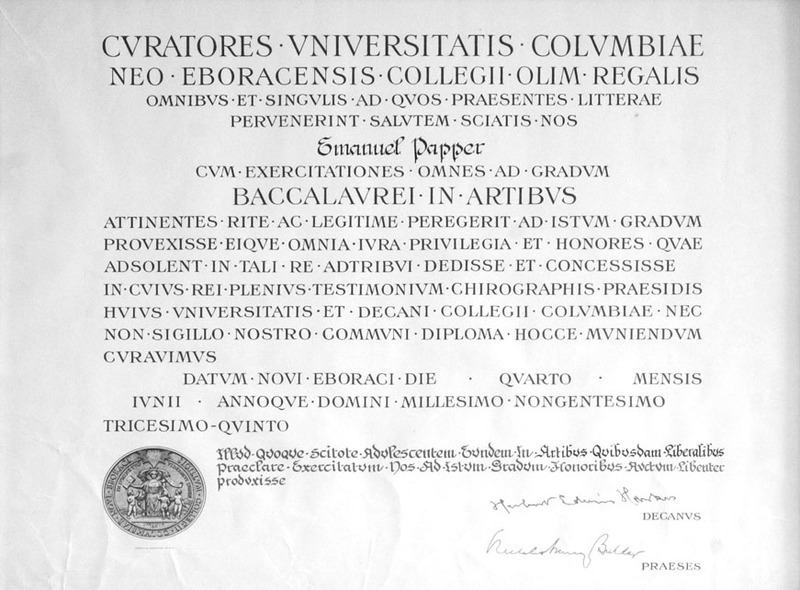 Both Barnard and Teachers College graduates are conferred Columbia diplomas. Columbia's General Studies school also has joint undergraduate programs available through University College London, Sciences Po, City University of Hong Kong, Trinity College Dublin, and the Juilliard School. The university also has several Columbia Global Centers, in Amman, Beijing, Istanbul, Paris, Mumbai, Rio de Janeiro, Santiago, Asunción and Nairobi. According to The Nation, some American universities "restrict discussions of Chinese human-rights abuses for fear of losing access to the country. Columbia University, for instance, canceled several talks on topics sensitive to the Communist Party because it was worried about offending Beijing." Columbia University was ranked 2nd among U.S. colleges for 2017 by Wall Street Journal and Times Higher Education and 2nd among Ivy League schools. It was ranked 3rd overall among U.S. national universities for 2018 by U.S. News & World Report. Individual colleges and schools were also nationally ranked by U.S. News & World Report for its 2016 edition. Columbia Law School was ranked for 5th, the Mailman School of Public Health 5th, the School of Social Work 5th, Columbia Business School 6th, the College of Physicians and Surgeons tied for 6th for research (and tied for 39th for primary care), the Graduate School of Arts 6th, Teachers College 7th, the School of Nursing tied for 5th in the masters program and 9th in the doctorate nursing program, and the Fu Foundation School of Engineering and Applied Science (graduate) was ranked 11th. Columbia was the first North American site where the uranium atom was split. The College of Physicians and Surgeons played a central role in developing the modern understanding of neuroscience with the publication of Principles of Neural Science, described by historian of science Katja Huenther as the "neuroscience 'bible'". The book was written by a team of Columbia researchers that included Nobel Prize winner Eric Kandel, James H. Schwartz, and Thomas Jessell. Columbia was the birthplace of FM radio and the laser. The first brain-computer interface capable of translating brain signals into speech was developed by neuroengineers at Columbia. The MPEG-2 algorithm of transmitting high quality audio and video over limited bandwidth was developed by Dimitris Anastassiou, a Columbia professor of electrical engineering. Biologist Martin Chalfie was the first to introduce the use of Green Fluorescent Protein (GFP) in labeling cells in intact organisms. Other inventions and products related to Columbia include Sequential Lateral Solidification (SLS) technology for making LCDs, System Management Arts (SMARTS), Session Initiation Protocol (SIP) (which is used for audio, video, chat, instant messaging and whiteboarding), pharmacopeia, Macromodel (software for computational chemistry), a new and better recipe for glass concrete, Blue LEDs, and Beamprop (used in photonics). Columbia scientists have been credited with about 175 new inventions in the health sciences each year. More than 30 pharmaceutical products based on discoveries and inventions made at Columbia reached the market. These include Remicade (for arthritis), Reopro (for blood clot complications), Xalatan (for glaucoma), Benefix, Latanoprost (a glaucoma treatment), shoulder prosthesis, homocysteine (testing for cardiovascular disease), and Zolinza (for cancer therapy). Columbia Technology Ventures (formerly Science and Technology Ventures), as of 2008[update], manages some 600 patents and more than 250 active license agreements. Patent-related deals earned Columbia more than $230 million in the 2006 fiscal year, according to the university, more than any university in the world. Columbia owns many unique research facilities, such as the Columbia Institute for Tele-Information dedicated to telecommunications and the Goddard Institute for Space Studies, which is an astronomical observatory affiliated with NASA. Columbia is a long-standing participant of the United States Department of Veterans Affairs Yellow Ribbon Program, allowing eligible veterans to pursue a Columbia undergraduate degree regardless of socioeconomic status for over 70 years. As a part of the Eisenhower Leader Development Program (ELDP) in partnership with the U.S. Military Academy at West Point, Columbia is the only school in the Ivy League to offer a graduate degree program in organizational psychology to aid military officers in tactical decision making and strategic management. In 2017, Columbia University's student population was 32,429 (8,868 students in undergraduate programs and 23,561 in postgraduate programs), with 42% of the student population identifying themselves as a minority and 28% born outside of the United States. Twenty-six percent of students at Columbia have family incomes below $60,000, making it one of the most socioeconomically diverse top-tier colleges. Sixteen percent of students at Columbia receive Federal Pell Grants, which mostly go to students whose family incomes are below $40,000. Seventeen percent of students are the first member of their family to attend a four-year college. Columbia Magazine is the alumni magazine of Columbia, serving all 340,000+ of the university's alumni. Arts and literary publications include The Columbia Review, the nation's oldest college literary magazine; Columbia, a nationally regarded literary journal; the Columbia Journal of Literary Criticism; and The Mobius Strip, an online arts and literary magazine. Inside New York is an annual guidebook to New York City, written, edited, and published by Columbia undergraduates. Through a distribution agreement with Columbia University Press, the book is sold at major retailers and independent bookstores. The Columbia University Organization of Rising Entrepreneurs (CORE) was founded in 1999. The student-run group aims to foster entrepreneurship on campus. Each year CORE hosts dozens of events, including talks, #StartupColumbia, a conference and venture competition for $250,000, and [email protected], a weekend for undergrads interested in design, engineering, and entrepreneurship. Notable speakers include Peter Thiel, Jack Dorsey, Alexis Ohanian, Drew Houston, and Mark Cuban. By 2006, CORE had awarded graduate and undergraduate students over $100,000 in seed capital. Access to Columbia is enhanced by the 116th Street–Columbia University subway station (1 train) on the IRT Broadway–Seventh Avenue Line. In February 2014, after learning that the university had over $10 million invested in the private prison industry, a group of students delivered a letter President Bollinger's office requesting a meeting and officially launching the Columbia Prison Divest (CPD) campaign. As of June 30, 2013[update], Columbia held investments in Corrections Corporation of America, the largest private prison company in the United States, as well as G4S, the largest multinational security firm in the world. Students demanded that the university divest these holdings from the industry and instate a ban on future investments in the private prison industry. Aligning themselves with the growing Black Lives Matter movement and in conversation with the heightened attention on race and the system of mass incarceration, CPD student activists hosted events to raise awareness of the issue and worked to involve large numbers of members of the Columbia and West Harlem community in campaign activities. After eighteen months of student driven organizing, the Board of Trustees of Columbia University voted to support the petition for divestment from private prison companies, which was confirmed to student leaders on June 22, 2015. The Columbia Prison Divest campaign was the first campaign to successfully get a U.S. university to divest from the private prison industry. The Band's official alumni organization, the Columbia University Band Alumni Association, registered protests with the administration, and an ad hoc group of alumni writing under the name "A. Hamiltonius" published a series of pamphlets exhaustively addressing the issue, but at the end of the spring 2017 semester the University administration held firm, prompting the Marching Band to again stage its show outside the building. For Orgo Night December 2017, Band members quietly infiltrated the Library with their musical instruments during the evening and popped up at midnight to perform the show inside despite the ban. Prior to the spring 2018 exam period, the administration warned the group's leaders against a repeat and restated the injunction, warning of sanctions; the Band again staged its Orgo Night show in front of the library. The Varsity Show is an annual musical written by and for students and was established in 1894, making it one of Columbia's oldest traditions. Past writers and directors have included Columbians Richard Rodgers and Oscar Hammerstein, Lorenz Hart, I.A.L. Diamond, Herman Wouk and Eric Garcetti. The show has one of the largest operating budgets of all university events. The university has graduated many notable alumni, including five Founding Fathers of the United States, including an author of the United States Constitution and a member of the Committee of Five;[n 1] As of 2011[update], there were 125 Pulitzer Prize winners and 39 Oscar winners, as well as three United States presidents. As of 2006[update], there were 101 National Academy members who were alumni. Former U.S. Presidents Theodore Roosevelt and Franklin Delano Roosevelt attended the law school. 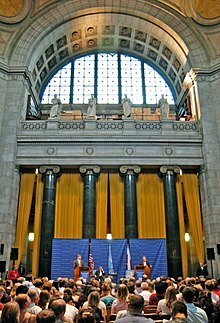 Other political figures educated at Columbia include former U.S President Barack Obama, Associate Justice of the U.S. Supreme Court Ruth Bader Ginsburg, former U.S. Secretary of State Madeleine Albright, former chairman of the U.S. Federal Reserve Bank Alan Greenspan, U.S. Attorney General Eric Holder, and U.S. Solicitor General Donald Verrilli Jr. Dwight D. Eisenhower served as the thirteenth president of Columbia University from 1948 to 1953. The university has also educated 26 foreign heads of state, including President of Georgia Mikheil Saakashvili, President of East Timor Jose Ramos Horta, President of Estonia Toomas Hendrik Ilves and other historical figures such as Wellington Koo, Radovan Karadžić, Gaston Eyskens, and T. V. Soong. [n 2] The author of India's constitution Dr. B. R. Ambedkar was also an alumnus of Columbia. University alumni have also been very prominent in the film industry, with 28 alumni and former students winning a combined 39 Academy Awards (as of 2011[update]). Some notable Columbia alumni that have gone on to work in film include directors Sidney Lumet (12 Angry Men) and Kathryn Bigelow (The Hurt Locker), screenwriters Howard Koch (Casablanca) and Joseph L. Mankiewicz (All About Eve), and actors James Cagney and Ed Harris. ^ Foreign heads of state include: Muhammad Fadhel al-Jamali, Giuliano Amato, Hafizullah Amin, Nahas Angula, Marek Belka, Fernando Henrique Cardoso, Gaston Eyskens, Mark Eyskens, Jose Ramos Horta, Lee Huan, Toomas Hendrik Ilves, Wellington Koo, Benjamin Mkapa, Mikhail Saakashvili, Mohammad Musa Shafiq, Salim Ahmed Salim, Ernesto Samper, Tang Shaoyi, Abdul Zahir, Zhou Ziqi, Wlodzimierz Cimoszewicz, Sun Fo, Chen Gongbo, Nwafor Orizu Juan Bautista Sacasa, and T. V. Soong. ^ As of June 30, 2018[update]. "Columbia University Posts 13.7% Annual Return". 2018. ^ Nykolaiszyn, J. M. (June 1, 2009). "Curating Oral Histories: From Interview to Archive". Oral History Review. 36 (2): 302–304. doi:10.1093/ohr/ohp054. ISSN 0094-0798. ^ "Disinvestment from South Africa#University campuses"